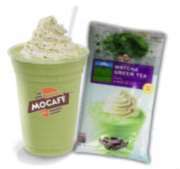 MoCafe Matcha Green Tea is a delicious blend of real shade-grown Japanese Matcha perfect for blended or shaken lattes. Sold in a case of twelve 12 oz. cans.